The final touches are going on the race bike today so that it is ready to load on the trailer Thursday morning. 2016 is going to be a very different year for the team both on and off the track. Now that I am no longer the President of the SRA-West I will be able to put effort back into my own racing promotion. I know I’ve slacked a lot with race reports and blog posts last year but the combined effort of running a race team and a race series was simply too much to handle. So let me take this opportunity to update everyone on where we’re at this year and also make you the promise to keep you more informed with the goings on of Team Johnny Killmore. Long-time co-pilot Giorgina Gottlieb has retired from sidecar racing as of October 2015. We were able to send her off with a double-victory at Las Vegas Motor Speedway on a very slippery track, an accomplishment I am very happy with. This is due in part to the fact that it was only our second event on a new machine and Gina’s second event in a year. I was able to finish out the season by trying out two co-pilots at our final race of the season. Matt Blank was absolutely new to sidecar racing but after two practice sessions in the wet he was able to run competitive lap times during the race without a hint of fatigue, landing a second place finish. Needless to say, he got the job. On top of the new co-pilot the team has a new (to us) outfit. This machine is still a Formula 2 design and is about 20 years old but it is much lighter and more balanced than our previous bike. The 1990’s era Shelbourne chassis was torn down to the frame and rebuilt by Superlite Cars of Fraser, Michigan. Fran Hall and the gang put our previous Suzuki engine in the frame and fabricated the necessary fuel system, cooling system, and exhaust required to make it work. It seems to have much more power but I’m not sure if it’s due to the free-flowing exhaust or the lower overall weight of this bike. Handling is much more capable but I’m still trying to get myself fit into the bike properly to take advantage of it. Ergonomics are always difficult but the controls are adjustable. The most important thing of all though is it’s fun again. I’ve been experiencing burnout in the worst way for nearly the last two years. I am now looking at a new season with a new bike and a new passenger, heck I even have a new website in the works. It’s also important to keep things in perspective, so we are running an abbreviated season instead of the full SRA-West calendar as usual. We will also go back to the Pikes Peak International Hill Climb and have a go at the class record again. With an improved bike and a switch to Avon Tyres I’m hoping to see less struggle with the machine and therefore more focus on the track and my racing line. We will also compete in three AHRMA events as detailed below. 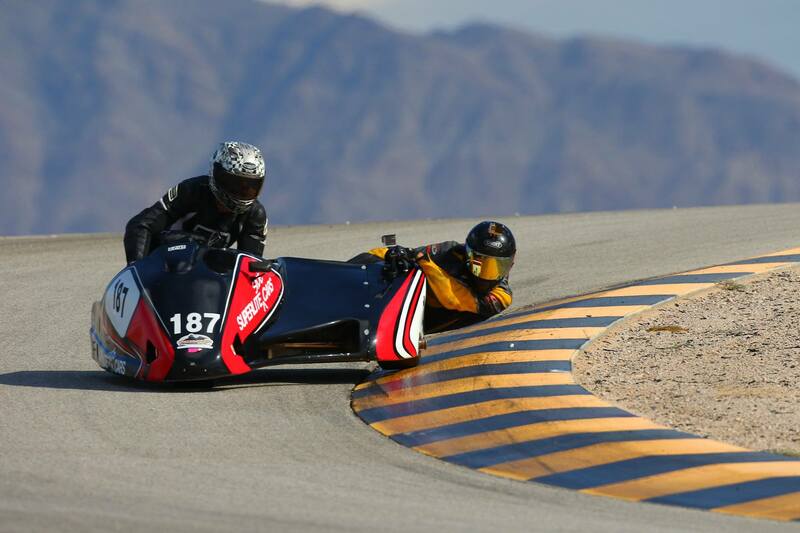 The season begins with a bang by hitting Willow Springs International Raceway for the Corsa Moto Classica and immediately heading back home to run at Sonoma Raceway. After that we are off until June 20-26 when we compete in the Pikes Peak Hill Climb, then we race again with AHRMA at Miller Motorsports Park (now called Utah Motorsports Campus) on September 2-4, at the Bonneville Vintage GP . I’m looking forward to racing again for the first time in years and I hope you come along to share in the excitement. New bike, new teammate, new goals, new website, and some new official Team Johnny Killmore gear are just a few of the things going on. I recommend signing up to the mailing list through MailChimp (the pop up window) if you want only occasional updates, but you can also use the blog sign form up at the bottom of the page to get an update for every blog post. I am changing the way I use this blog page though so there will be less clutter in the future; just information about what I am up to professionally inside and outside of racing. Lastly, you can just follow one of my social media accounts and follow that way. Obviously I like to stay connected. Twitter and Facebook are the easiest ways to send short posts from the track and Instagram is a great way to post photos from the road or trackside. And also thanks to Avon Tyres for continuing to make a sidecar specific race tire in multiple sizes, compounds, constructions, and even full-wet and intermediate designs.